It’s not every day that you come across someone like Salvo, who runs duranasty.com, a website based in Italy but internationally known as one of the most up to date and interesting fan sites. I have had the pleasure of meeting Salvo (who was more than willing to support our effort) through one of our featured artists, Stephane Leclair. 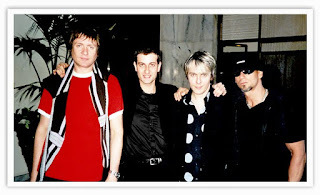 It is clear when you read about Salvo and visit his site that he has a passion for the band that spans the years, that his love for the band is timeless. He is truly an example for many in the Duranie community, as he has 'left the light on' for the band through all the ups and downs in their career, through his website Duranasty and many other amazing efforts he has been involved with to promote the band. Salvo, it is truly an honor for us at DDTTRH to interview you. Thanks for taking the time out of your busy life to speak with us. Yes, that sentence ‘every single day of my life’ might sound as a commonplace but that’s just the truth. I can’t actually remember a day in my life since I was a kid without doing something related to Duran Duran (listening to their music, organizing a trip to see them somewhere in Europe, collecting their stuff, writing an article for a fanzine, scrapbooking in the 80s and web-surfing to find some cool news today). That has been a long, long, journey and I can’t actually remember a low period of ‘duranmania’ in my life, I was there when Wild boys was released and they were on the front cover of every single magazine and on every tv show but I was there also when Medazzaland was released, in Usa only, and you could barely see them in any media, in the band there were only two of the orginal fab five and they were even dropped by EMI. When I try to look at myself from the outside I always get surprised realising how the passion has always been there, exactly the same, during the last 3 decades and was even the same, possibly stronger, during one of the lowest times of Duran Duran’s career, Pop Trash. Someone Else Not Me! Salvo and the band reduced to a 3 piece in Milan during the Pop Trash promotion. Almost 39 years old, father of two, in the last few years I have asked myself on more than one occasion why this passion has never abandoned me. I just think that it has never left me firstly because Duran Duran, their music, their vision, their art, immediately became part of me, just one of the aspects of my personality… it’s in my blood I guess, in my dna, or should I say DDna? I always been very very critical of myself, even ruthless sometimes. I apply criticism to every aspect of my life so despite the loyalty and the passion, I have never permitted duranmania to drive my life. I always gave importance to many other things and interests, human relationship above all. So I guess the secret of the longevity of some die-hard fans over the years is just constancy, balance and love diluted in a long time, not only when a new album gets released, which is even easier when the album is successful. I think I’ve lived these almost 30 years of duranmania with balance, no big excesses, (well maybe a bit when I was younger, but that was fun! ), just a bit of Duran every day. It’s like a 30 years old marriage: Duran Duran a band for life! That sounds more like a psychoanalysis session than a proper interview but I’m just opening myself to you trying to give you the most sincere and real portrait of me not only as a long time fan but as a person. 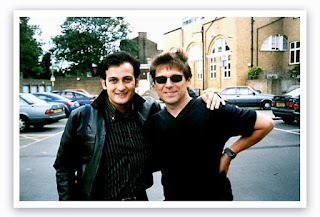 I’m sure some fans out there will identify themselves in some aspects of my story because there are really many great loyal fans in the Duran Duran community. They may not run a fansite but they have been huge duranies every day of their lives, they have all my appreciation and I’m just glad to be part of this great community. 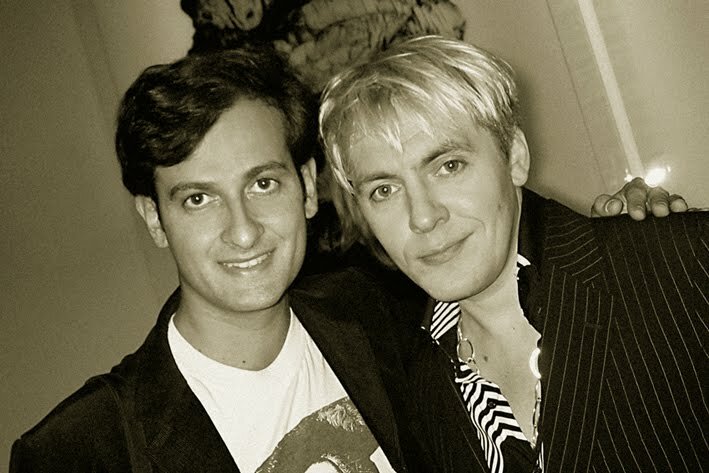 With Nick at the Albert Watson exhibition in Milan, 2004. Kirk, DDTTRH: When did Duranasty officially start? Do you have people helping you? Salvo: behind duranasty.com there’s only me, I do it all on my own, I do the writing, the interviews, the visuals and the webdesign… it’s a lot of work, believe me. Old style, the beginning of Duranasty: the old version of the site. A screencap dated 2002. I had to communicate with the rest of the fan base so this little baby, duranasty, saw the light on february 2nd 2002, the same day Planet Earth was released back in 1981. Next year is gonna be duranasty.com’s 10th anniversary! It had no claims, there were already plenty of cool DD fan sites, very professional ones, and mine was just a home-made website and it used a web public service, it was hosted on Geocities! Kirk: Why did you name the site “Duranasty” and use the payoff “The Life and Times of Duranasty”? July 2010. With the founding members when he payed a visit to the band at their London recoding studio. The band guys putting final touches to All You Need Is Now. That word says it all to me, it was the perfect name to give to the my webzine, a way to celebrate the history of the band. “Duranasty.com is a site with one step into the past, one in the present and eyes always looking to the future”, that’s the sentence I used in the splash page to celebrate the 30 anniversary of Planet Earth. I think it just declares duransty.com’s mission. Since the newest album has been released, thanks also go to the great promo jobs that Simon, John, Nick, Roger and their team are doing. We get daily updates from Duran Duran’s official sites, facebook and now even personal updates from John and Simon on twitter. They are doing such a great job and I just love this kind of instantaneous interaction, it’s just what the fan-base wants, we want to be part of the process and with internet now we are all part of the process and all authors in first person of Duran Duran’s success (just think what we all did with the iTunes release on december 21!). I hope they’ll keep this kind of connection and interaction also when things will be quieter and there won’t be much report about. With Simon and Nick at the Milan Municipality the day they got ‘Style Icons of The 20th Century’ recognition back in February. Kirk, DDTTRH: So I know you can't talk about Duran Duran and not mention the loyal fans in Italy. Why do you think Italy has become such a loyal country to the band? Salvo: As you all know in late February Duran Duran came to Milan to receive the recognition ‘Style Icons of The 20th Century’ and launch the new album. 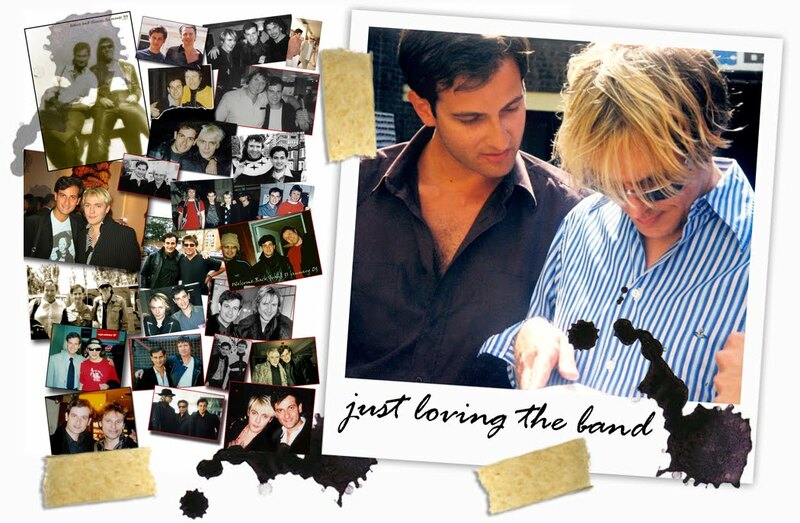 During those days they often used the sentence “Italy loves Duran, Duran loves Italy” to describe the deep relationship that links the band to my country. I don’t know how it actually happened, why Duran Duran, but there’s a strong empathy between Italian fans, the general public and these guys. That empathy started in the mid 80s, duranmania arrived here only in late 1984. Duran came a couple of times on promotional tour in ‘82 and ‘84 but the hysteria only exploded in late 84/early 85 (their presence at Sanermo Festival ‘85 was just the beginning of the Duran fandom which culminated in the Strange Behaviour Tour two years later). That’s incredible if you think that their first live Italian tour only arrived in 1987. You might ask why they connected so well and so deeply with the audience if they didn’t tour the nation in those years? Maybe it was all emphasized by the fact that we couldn’t get them, they were the untouchable stars and their image passed only through a poster or the tv screen so they soon became a myth. The more the people wanted them the more couldn’t get them. In marketing this is called ‘Marketing of Deprivation’, the more you want a product and you desperately seek for it, the more you can’t get it as the company deliberately doesn’t distribute. They just want people to talk about the product, to generate the myth. It’s a strategy that increases the request for the product. But that wasn’t the case with Duran Duran. There wasn’t any strategy behind the fact that we couldn’t get them live in Italy, and it wasn’t that they didn’t want to come. It just wasn’t possible. In fact, the years when duranmania exploded in Italy were also the years when the band split up into two bands, Arcadia and Power Station plus we had John and Andy Taylor’s solo projects. This whole scenery helped to generate the myth of Duran Duran in Italy, they represented more than just great pop music and video clips, they became a social fact. Laughs with Dom and John in the hot southern Italy during the Red Carpet Massacre Tour. Simon Le Bon in the 80's would have had a laugh and dismissed this mass phenomenon. He once said “It’s just because of the blue eyes and the blond hair, having blue eyes and blond hair in Italy!” in answer to a journalist’s comment about the news (reported in a major newspaper) that 90% of the Italian students in 1987 knew who Simon Le Bon was but they didn’t actually know the name of the Italian President. I guess the band captured with its music and its imagination an entire generation of dreaming Italian teenagers. It actually became something bigger then band itself and it involved not only the fans but also their families (we were all in our very early teens, and what was happening surprised everyone), the media (Duran were on the front cover of all kind of magazines every week from 85/87) and even some sociologists and psychologists were involved, as observers, in the process. It wasn’t only about the music, they were icons, teenagers just identified their own dreams in Duran Duran’s music and in their videos. I think it happened to Duran Duran not only because they were a great pop band, but also because Italy has never really lived a huge mass phenomenon like the Beatles or Elvis. Of course those myths and the fandom around them arrived here, but not with the same impact that those stars had in UK, USA and other parts of the world. 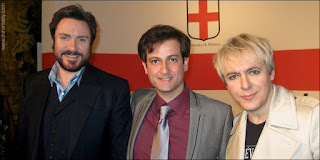 Italy got its very first episode of mass phenomenon and fan-hysteria with Duran Duran, which became a social fact, unique in terms of fan-following, people and media involved in the process. Everything happening with new bands after Duran Duran has always been considered a replica of those Duran years. Nothing as strong has actually happened again. 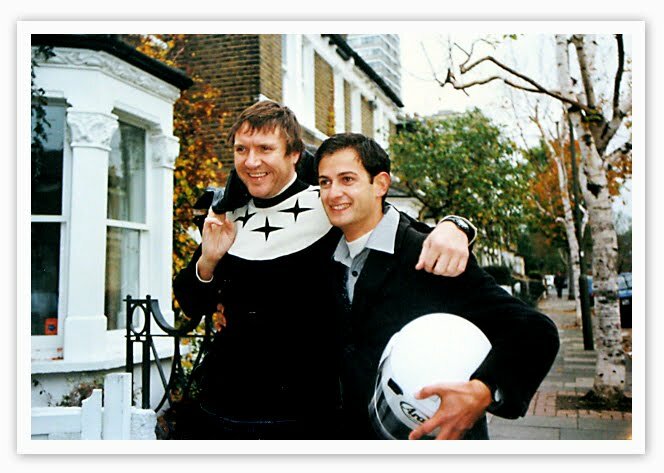 With Roger in London, early Astronaut sessions, June 2002. 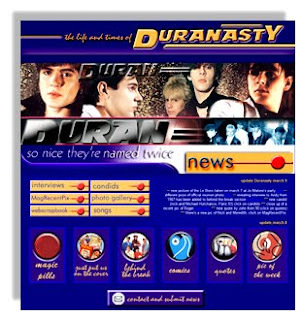 Besides the social aspect of it I have to say that anything Duran have done over three decades, every time they had a new record to promote, there has always been great attention from the Italian media (even though back in the days some journalists had slagged them accusing ’em of being just a pop sensation for teenagers). Nothing Duran-related has gone unnoticed, even a remix like Burning the Ground to launch their Decade, back in late ‘89, was something to talk about in the media or John Taylor’s involvement with Johnatan Elias’s Requiem for the Americas has led him on a popular prime time tv show. Where this would have happened in the 90s? Duran Duran has always been considered a big act here and they still generate an awful lot of media attention. So if in 1990 in the UK the only way to be on the cover of a magazine and promote Liberty was posing with their wives and newborns in their beautiful houses, here in Italy they still had front covers of music magazines and they were interviewed about their records. Love is mutual and has never ended, that’s why Italy was one of the first countries in the world where AYNIN reached #1 in December and now, with the physical release, the only country were they have touched the top ten. Duran Duran here is a social fact, they are part of our lives, at least of everyone who has lived the 80s with young eyes. They are part of our collective imagination and this is a great base to start if the music you offer to your public continues to be top quality and always contemporary like Duran Duran’s music. To visit Duranasty, please go to duranasty.com. 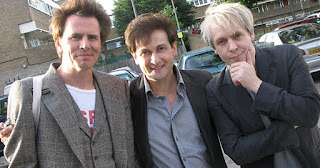 Please visit Duran Duran to Timeless Rock History on Twitter (@DDTTRH)!